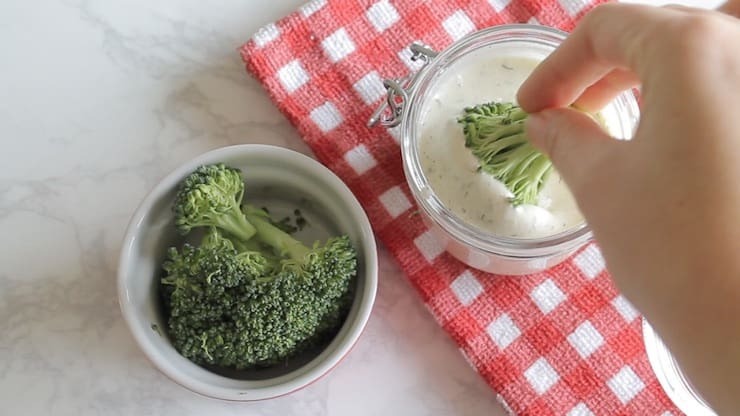 This quick and easy paleo ranch dressing recipe is a thick, creamy and tangy delight. Filled with herbs and spices, it's the perfect keto and vegan topping or dip! 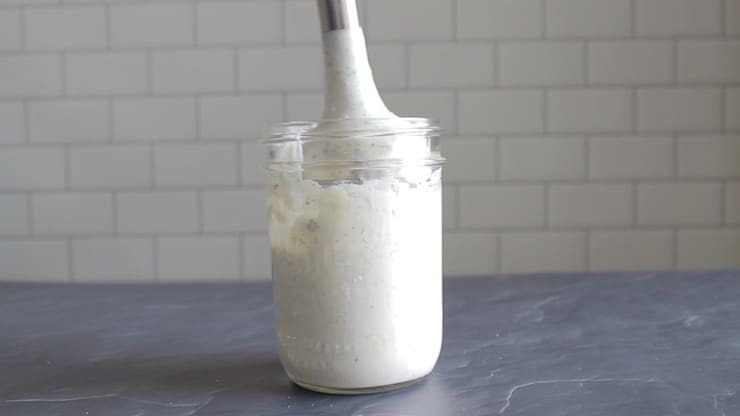 This quick and easy paleo ranch dressing recipe is a thick, creamy and tangy delight. Filled with herbs and spices, it’s the perfect keto and vegan topping or dip! 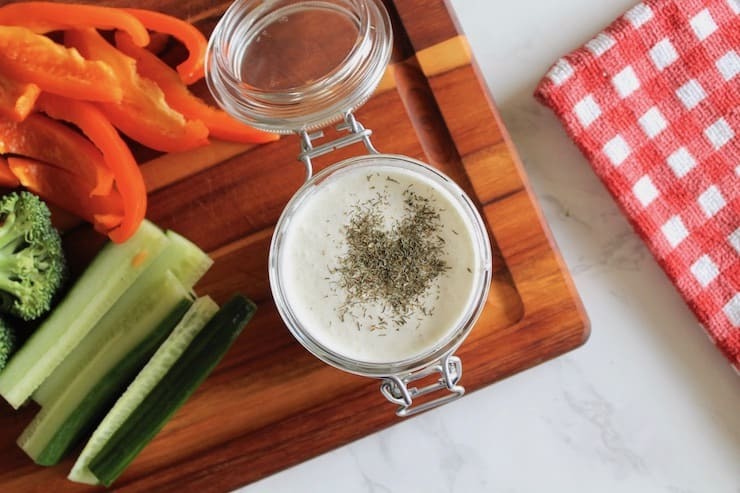 I’m obsessed with this paleo ranch dressing recipe and have been putting it on everything! 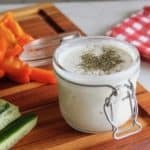 If you’re paleo, keto, vegan or dairy free and craving ranch, then this recipe is perfect for you. It still has that creamy rich thick texture of ranch and the flavor of herbs like parsley and dill…all without the dairy! 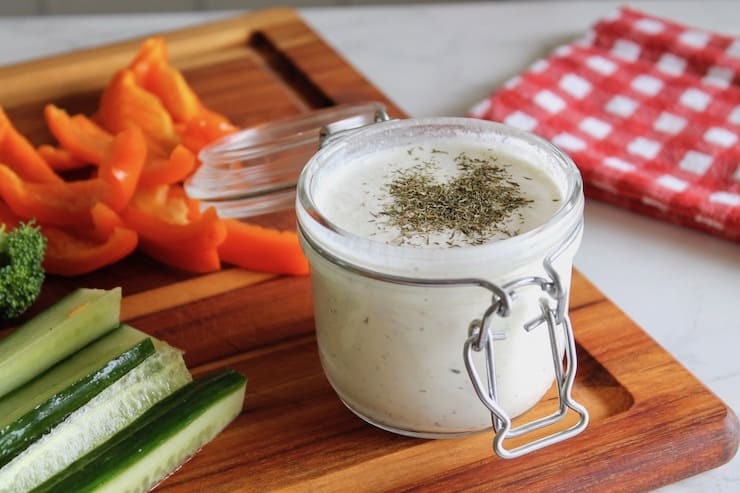 This paleo ranch dressing recipe is the perfect thick and creamy texture all without the unhealthy oils and additives that you find in store-bought ranch dressing. This recipe is super quick and easy and only takes about 5-10 minutes to whip up! 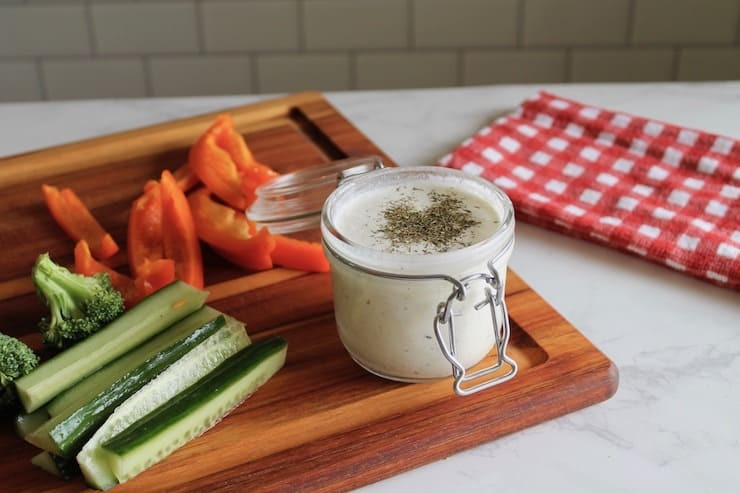 Not only does this paleo ranch make a great salad dressing, but it’s also great as a dip for veggies or chicken fingers. It’s also great for dipping buffalo wings! 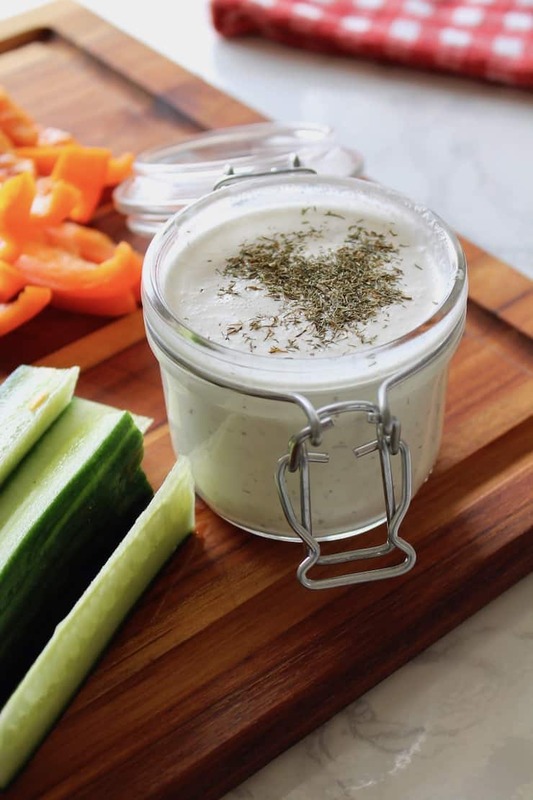 The herb and spice blend gives this delicious recipe that classic ranch flavor and the apple cider vinegar gives it the tangy flavor that usually comes from buttermilk. You will need a hand blender or a regular blender for this recipe to emulsify the dressing. You can use unsweetened unflavored almond milk instead of coconut milk in this recipe, but it does make the recipe a bit thinner. It also changes the flavor a bit, but it helps it if you add a bit more apple cider vinegar to get that tangy flavor. Try adding an extra 1/2 tsp of apple cider vinegar at a time until you get the right flavor. This dressing will keep for about 1-2 weeks in a jar in the fridge. 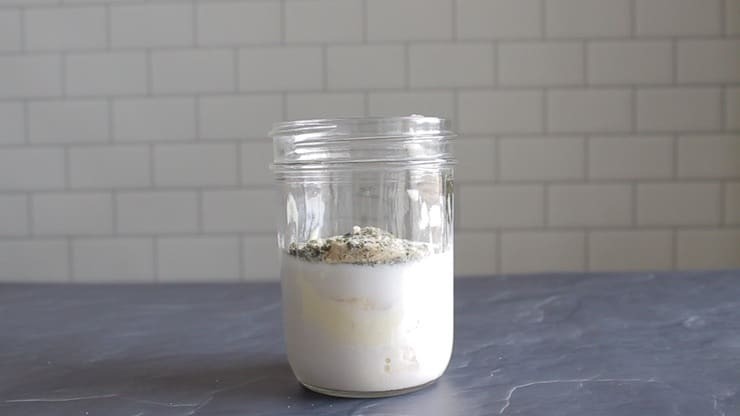 First, combine all of the ingredients in a bowl or jar if you’re using a stick blender. If not, put all the ingredients in a blender. Blend all of the ingredients together until fully mixed. Use as a dressing for salads or as a dip for veggies. Store in the refrigerator. Did you like Easy Paleo Ranch Dressing Recipe (Keto & Vegan)? Don’t forget to rate the recipe and leave me a comment below. You can also follow me on Facebook, Instagram, Pinterest! In a bowl or jar, combine all of the ingredients. Use a hand blender or regular blender to emulsify the liquids and mix together the other ingredients. Blend for about a minute and enjoy! This post was originally published in May of 2014 but has been republished in November of 2018 to include new and improved recipe tips, photos and a video. Just tried this and added a half an avocado and rosemary with a clove of garlic in the blender, so amazing!! First time making my own dressing, thank you for this!! Yum! Sounds like tasty additions! Yas Queen! This looks positively dope. I can’t wait to show this to Sebastian!